We hope you're enjoying this festive time of year. We want to thank our Peirce family for all you've done to help those in need over the past few weeks. Here's a look at all the ways we've been giving back during our Season of Giving. We collected 22 pints of blood during our annual American Red Cross blood drive. One donation can help save the lives of up to three people, according to the American Red Cross, so this small gesture has the potential to save the lives of over 60 people. Our Health Programs Student Association sponsored a canned and dry goods donation drive to support the Philadelphia Veterans Multi-Service & Education Center, Inc. We collected six boxes of nonperishable food items, which will help many veterans and their families enjoy a hot meal this holiday season. Peirce College President & CEO Jim Mergiotti; Stephanie Donovan, Faculty Chair, Health Programs; Luanne Amato, Assistant Professor, Healthcare Administration; and Kathleen Watson, Assistant Professor, Healthcare Administration pose with Kent Milliken, Director of Economic Development and Jaclynn Ries, Perimeter Program Coordinator of the Veterans Multi-Service & Education Center. 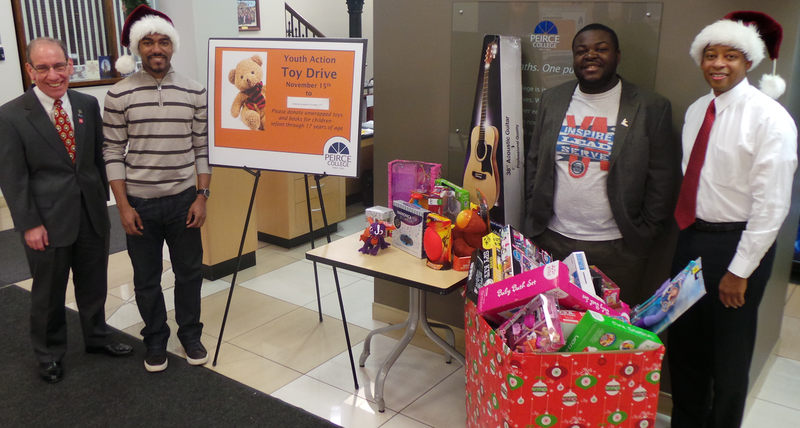 We also collected 52 toys and books for at-risk children and teens through the Youth Action Toy Drive. These gifts will go primarily to children and teens living in area shelters or transitional and crisis housing in Philadelphia, and hopefully brighten up their holiday seasons. Peirce College President & CEO Jim Mergiotti and Chuck Wright, Vice President, Institutional Advancement pose with members of Youth Action. The Peirce College faculty and staff have collected money the past four holiday seasons to purchase uniforms for elementary students in need at Thomas May Peirce Elementary School. This year we were able to raise money to purchase 126 uniform pieces, including cardigans, shirts, pants, skirts, socks, and tights. Students who have been identified by the school’s staff will receive some of the pieces, and the rest will be kept in the nurse’s office and issued to students as needed. I pose with Ms. Marilyn Jones, teacher's assistant; Mr. Terrel Parris, principal; Ms. Paula Sahm, fourth grade teacher; and 5th graders from Thomas May Peirce Elementary School.